Backlash Jazz Quintet was formed in 2002 as a vehicle to explore one of the great eras of jazz - the 1960s Blue-Note hard-bop style. It was during this decade that some of the greats including Cannonball Adderley, Art Blakey, Lee Morgan, Freddie Hubbard and Herbie Hancock all recorded ground breaking albums with quintets. The repertoire of Backlash has always been selected to reflect the energy and drive of this style. While the repertoire expanded to include additional styles such as funk and latin material, the core of Hard-Bop has remained central to the band's identity. Backlash Jazz Quintet has recently recorded an album of original material influenced by this background. 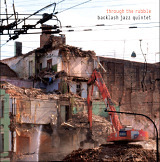 "Through the Rubble" is available at any Backlash performance or through this website. Having held residencies in the Perth CBD, Backlash has also performed regularly at recognised jazz venues including the Perth Jazz Society, Jazz Fremantle, The Ellington & Cafe Piazza Jazz Room, performed at various festivals including York Jazz Festival, Bunbury Jazz Festival, Subiaco Music Festival and toured throughout WA to the Bunbury, Albany and Geraldton regions.